You may have seen my Premature Book Review on this title. I finished it and thought I would follow up a bit. 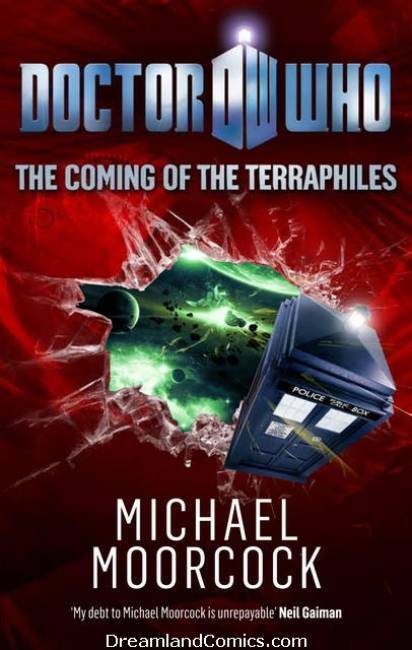 This is very much a Michael Moorcock book rather than a Doctor Who book. It appears that Moorcock is a fan of The Doctor, and why wouldn't he be? Time travel, a multiverse, heroes an villains. Seems like a natural. I am not sure, however, that he was particularly interested in writing about the 11th Doctor and Amy Pond, but they are the current flavor. I will stand by the idea that this book does not have to be about Doctor Who. It could be Elric or Jerry Cornelius, and there is a bit of Edgar Rice Burroughs (one of Moorcock's idols) thrown in. Nothing major, but there are many mentions of Barsoom and at least one thark makes a brief appearance. That being said, I enjoyed it a great deal, but I do love the man's work. It is nothing like the Torchwood book I read, which for me was wonderful as I was unfamiliar with the show and it was very self referential. I think this might have served as a non-Who book altogether, but you might as well play off the popularity. I think we're in general agreement there. You could have swapped out pretty much any characters for Moorcock's generic Doctor and Amy and the song would have stayed the same. I'm sticking with my original belief that this was a pretty poor Doctor Who book, but a half-decent Moorcock one. The resolution of the multiversal collapse was certainly pure Moorcock and unlike anything associated with the Whoniverse. I'm 60 pages in and tempted to abandon the book. It's dry, dull and plotless. Which might be fine if someone's writing a part of a huge saga, but this is a Doctor Who story. There should be something going on. Not to mention, you know, the Doctor and Amy. So far they're simply cameoing in their own book. I'm giving it to page 100 at which point if nothing is still happening I'm bailing.